Buying a used guitar online is risky. Your best bet, buy far, is to march down to your local guitar store and play all the guitars in your price range until your hands and your ear tell you what to buy. Buying online rules out the most important aspect of a guitar purchase: the sound of the guitar. If it is electric: how do the pickups sound in the neck and bridge (and mid) position? Does it give you a classic, crunchy distorted rock sound, or more of a twangy, single coil sound? If it’s acoustic: is the sound big and full, or weak and tinny? How does it feel? You gotta to feel it! What do your hands think about the neck, body, and weight of the guitar? It’s always better to hold the guitar you are going to buy. Even if you are a beginner who doesn’t know his/her first chord, your hands will tell you what they think. fretguru.com’s string height gauge. Know how high the strings are before you buy. Before you venture out into the internet wilderness in search of a sweet guitar to love, run down to your local guitar shop first. 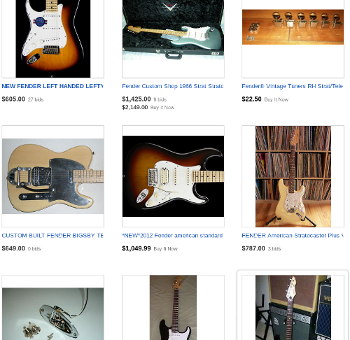 So assuming for some reason you can’t buy local–you live in an igloo or you are holed up in a mountain shack with a fast internet connection–here are the rules for buying guitars online. What we are doing here is trying to minimize risk and give you a good chance of getting the right guitar. Rule #1: Know what you want. If you know what type of guitar you are going to buy: say a Fender type with a contour body or a Les Paul type that is a bit heavier, then you have a good idea about how the guitar might feel, which is better than nothing, but it’s only an idea. A Fender Squier Bullet is a fine starter guitar, but a Fender USA or Fender Japan strat is going to feel better/different. Rule #2: Only buy if the pictures are high-quality, close ups that show every angle. Don’t let your imagination fill in the blanks. Rule #3: Ask the seller if the neck is flat. If the neck has a very slight bow, that’s ok, it’s called relief, but too much makes for a crappy guitar experience. Pictures really can’t show you if the neck is flat. Rule #4: Ask the seller to measure the distance between the bottom of the 6th string and the top of the fret wire at the 12th fret. Same with the 1st string. If you are buying an electric, the distance should be under 2mm. If acoustic then 3mm is good and 4mm is pushing it. If this is as close as it gets, don’t buy it. It looks pretty from here but… And look at the background. It’s not in a home so I’m assuming it’s a guy who sells guitars second-hand. This isn’t a deal breaker, but I like guitars from the original owners. Rule #5: Make sure the guitar comes from a good home. Does the current owner of the guitar keep it in a case? Hard is best. Soft case is ok. No case is a problem. Is the guitar laying out in the street, or lovingly placed on a soft blanket or carpet? Does the guitar look like it’s been played out its whole life? A guitar that’s been gigged should be avoided. Usually guitars that spend a lot of time in bars have been dropped, banged, dinged, have had beer spilled on them, and are occasionally thrown at under-performing drummers. Let the pictures be your guide. I always check the surroundings. Is the guitar in a warehouse or garage surrounded by oily junk: bad. Or in the corner on a stand near a bookshelf in a nice, clean room: goooood. Rule #6: Newer is better. There’s a whole lot less to go wrong with a ten year old axe as opposed to a 30 year old one. That’s a full twenty years of drops, dings, small children with peanut butter on their fingers, etc. Rule #7: Be patient! Make sure you have the money in hand and have decided on how much you are going to spend before you start looking. You also need to know what type of guitar you want. 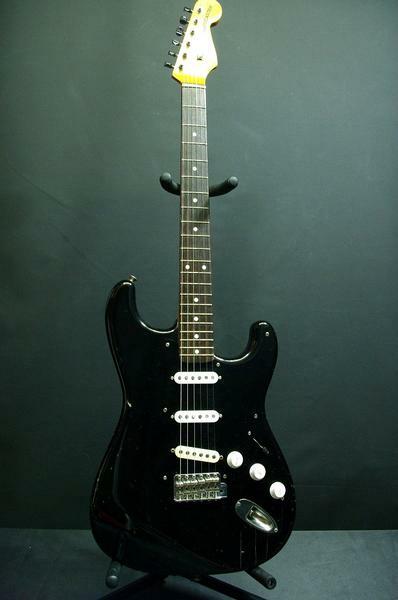 Here’s an example: strat type with contour body, under 10 years old, clean, flat neck, string height ok (see rule #4). Then you wait very patiently for the right one to come along. Ignore the Rules at Your Peril! The first guitar I bought online was a late ’70s Yamaha SL-380 (MIJ, Les Paul style) which was beautiful–tobacco sunburst with the wood grain showing through the nitro finish… But the neck tweren’t so hot. It has a bit of a bow that’s more than relief. It’s playable and I use it daily, but if I had taken my own advice, I wouldn’t have bought the Yamaha. I didn’t have string height measurements and there was no mention of the neck in the description. The pictures were good, but they can’t tell you everything. I hope this helps someone find the right guitar online. Post a comment of your triumphant successes (or failures) purchasing used guitars online.